Nexus S 4G is the hottest Android phone for folks on sprint and since bootloader has been unlocked with root, there is a raising demand of custom ROM, mods and hacks. Earlier I posted a complete guide on flashing / installing Android 2.3 Gingerbread based CyanogenMod 7.x on Nexus S 4G, and today it’s MIUI ROM that got ported. MIUI is also a custom Android firmware that was born in China, but overtook the whole modding community because of its great functionality and thoroughly optimized user experience. Like CyanogenMod, MIUI ROMs are also based on AOSP Android source code with loads of positive tinkering done to provide optimum user experience with high quality on-board theming aesthetics. 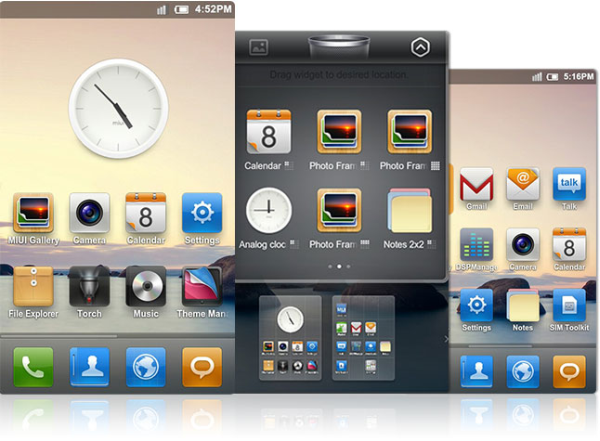 Although MIUI ROM stands out because of it’s great looks, but it also managed to draw some criticism because of it’s high level of similarity with iOS. One basic reason that you should get a MIUI ROM on your rooted Android phone is the speed factor. It has been widely noticed that MIUI seriously revitalizes the speed of your Android device along with offering compatibility and ease of use at the same time. One major drawback , and I believe the only one, is MIUI’s language incompatibility! Because of the fact that it was essentially targeted towards Android users in China, so integrating language packs sometimes can cause loads of trouble. However as there are scores of Android developers working to make the system better, unlike any other popular OS, so you get to have a MIUI build in your language released every now and then. The MIUI port for Nexus S 4G is now ready but like every other initial code, it has some bugs that need to be addressed fast from developers. The biggest bug so far is losing WiMax capability after flashing this ROM along with some users reporting issues with their Wi-Fi connectivity and MMS. In case you don’t really want to encounter these glitches, then its in your best interest to stay away from this ROM and wait for a stable and bug free build. The credit for this port goes to warttrack from XDA and MIUI Official forums. In order to install MIUI Android 2.3 Gingerbread Custom ROM on Nexus S 4G, you’ll need the following. A Rooted Nexus S 4G. You can follow our guide posted here for more details regarding rooting and unlocking bootloader. The foremost step is to make sure that your phone has root along with an unlocked bootloader. You can root your phone by clicking on the link provided in requirements section. Now connect your Nexus S 4G over a stable Wi-Fi internet connection, launch Android Market and download ROM Manager. Once the ROM Manager is downloaded, launch the app and tap on Flash ClockworkMod Recovery. After CWM is flashed on your phone, connect your phone to the computer and copy the MIUI ROM file to SD Card root. You can download MIUI ROM for Nexus S 4G from link provided in requirements section above. Now launch ROM Manager again on your phone and reboot your device in Recovery mode by tapping on Reboot In Recovery. Once you are in Recovery mode, navigate down to WIPE Data / Factory Reset and select to wipe. Please note that it’s not necessary, but do make a Nandroid backup of your current settings from Recovery to be on the safe side. Sometimes things don’t quite go as planned and your Nandroid backup might turn out to be your only resort to make your phone functional again. Once done, go to Recovery main menu and then select Flash Zip From SD Card. From the resulting menu, select the MIUI ROM Zip file you earlier copied to SD Card root. Once installation is done, reboot your phone using the first option in Recovery menu. The first boot will take quite some time as MIUI is setting up your phone etc. And there it is! Your phone is now running MIUI Gingerbread custom ROM on Google Nexus 4G. In case you are stuck, need support or want to give feedback, then head to the official MIUI forums thread posted here.